Dermablend helps to cover flaws. Hide your skin imperfections with Dermablend makeup. You may be surprised with the transformation that a few products can create. There are even products designed to cover tattoos, stretch marks and spider veins. With cosmetics available such as Dermablend, there is no need to be embarrassed of your flaws. This makeup not only will make you feel better about your skin but will make you look great as well. Dermablend has a full line of products including foundations, concealers and setting powders. In addition, they offer kits with products and quality makeup brushes. Cover Cream Foundation is a full coverage product that claims to give 12 hours of wear. When used with the setting powder, it is both water and smudge resistant. This foundation is light and contains SPF 30 as well. Leg and Body Cover Foundation is made for those needing to hide major skin flaws on large areas of the body. It contains SPF 15 and claims to give 16 hours of coverage and wear. This product works best when used with a setting powder. This foundation can reduce the appearance of varicose veins as well as hide tattoos and cover up any scars. Use it when you want to bear skin that has flaws. Smooth Indulgence Concealer offers full coverage and is oil-free. It has a lightweight feel and works well on all skin types. 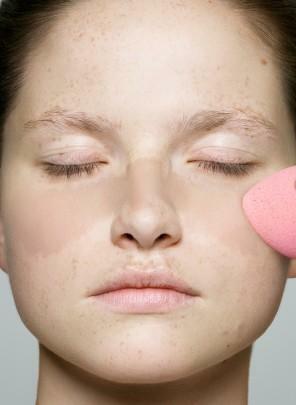 Redness Concealer is made to minimize red skin flaws such as rosacea, acne scars and port wine stains. It is designed to be used under foundation. Quick Fix Concealer is great for those looking for a long lasting concealer that won't enhance wrinkles or pores. It is blendable and comfortable to wear. It contains SPF 30 and claims to give 16 hours of wear. All Dermablend products work best when used with a setting powder. Dermablend setting powder comes in either loose or pressed versions. This is an important step in the Dermablend process. It not only sets makeup, but also makes it more wearable and smudge-resistant. The Dermablend website has video and helpful tips to help you achieve your desired look with their products. Check out the 'how to apply' section for detailed instructions. Dermablend makeup can be purchased at most department stores as well as online. The makeup may cost more than drugstore brands but can yield better coverage for scars and flaws than standard foundations.